Xbox Smartglass is scheduled to launch on Friday 26th October along with Windows 8 and the Microsoft Surface. The Smartglass app is ready for download right now for Windows 8 and Windows RT from here but the other half of the equation, an update to the Xbox dashboard, will be available on Friday. 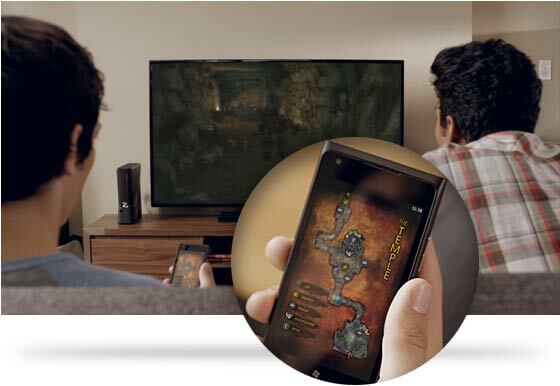 Xbox Smartglass will make your phone or tablet “the best remote control in your house” according to the Official Microsoft Blog. The free Smartglass app “connects your devices to your Xbox entertainment and it’s available for the devices you already own.” The app will be available for Windows Phone 7.5 or higher, Apple iOS and Android (4+) “soon”. Mark Budash demonstrates using the app on a Windows tablet in the video below. He sends a movie from the tablet screen to the big screen TV. When the movie is on the big screen he shows that the tablet becomes a supplemental screen giving info about what is currently playing and chapter and scene selection. Music works similarly and also offers suggestions for your listening pleasure from Microsoft’s large web catalogue of music. Web browsing on your big screen TV also looks slick and intuitive using a smartphone as the touch controller for IE on the Xbox 360. Transferring your browsing session between TV, smartphone and tablet is also easy. Mr Budash demonstrates watching sports on the Xbox in concert with Smartglass used for stats, info and replays. The final part of the Xbox Smartglass experience, for now, is fittingly to get more from your games. The Microsoft blog says that you can “Get more from your game when you can use a second screen”. The second screen may be used for a GPS in a racing game, a playlist controller in a dance game or interactive stats and inventory in an FPS. Games need to have such functionality built in of course. More such second screen game enhancements are planned in forthcoming titles and Microsoft says that it has “only begun to scratch the surface of what’s possible”. A cynic might say that other possibilities include using any innovative ideas from upcoming Wii U games! Read more about Xbox Smartglass and see more videos on the official Microsoft site here. Why don't we have second monitor features for games on PC? I've been using a second monitor for years and I know of only 1 game that has supported it to date, Supreme Commander, and it wasn't that good. I'd love to have the option to keep a map on my second screen in Skyrim or perhaps a quest list showing everything completed in your active quest and what needs to be done next. That looks quite awesome - although I have already been doing similar things due to apps already having this feature. I use Gmote as a touchpad and for streaming and controlling media, and browsers can already sync tabs etc. Although this will probably be more seamless if implemented well. Really just an attempt to make the Surface more sellable. I have to admit surface looks nice but the price is just silly.